It can be difficult to talk to your doctor. You might be embarrassed, or you might feel too rushed or nervous to remember what you wanted to say. But talking honestly to your doctor is one of the most important things you can do for your own health care. If you cannot talk openly with your doctor, you should find another doctor. The American Academy of Family Physicians (AAFP) offers some tips to help you talk to your doctor, and to get the most from that conversation.. Think about what you want to say before you get to your appointment. In fact, the AAFP suggests that you keep a health journal, writing down your symptoms and concerns as they happen, and bringing that with you to your appointment. By keeping a health journal, you will be able to tell your doctor exactly what you were feeling and when, as well as what you were doing when you had the symptoms. You also should talk to your doctor about things that are going on in your life. Are you stressed or worried about something? Have you decided it is time for you to lose weight or quit smoking? Has something joyful happened in your life? All these things can have an impact on your health. Prepare a list of your medications, and bring it with you to your appointment. Write down the names of any prescription medications you take, as well as the dosage. But also write down any herbal medicines, vitamins or supplements you take, so that your doctor can see if there are any interactions between your prescription medications and other supplements. And be sure to tell your doctor about any side effects you are feeling from your medications. Bring a pad and pen, so that you can write down any suggestions or directions your doctor has for your care. If you have trouble writing or are afraid you would find it too distracting, bring a pocket tape recorder and ask your doctor if you can record the conversation suggestions. Make sure you understand everything the doctor tells you. 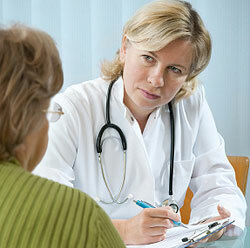 Don’t worry about bothering the doctor with questions; answering your questions is a major part of the doctor’s job. If you don’t understand something, ask for an explanation. If you still don’t understand, ask again. If you have more questions than you and your doctor can cover in the time allotted for your appointment, see if a nurse or physician’s assistant can answer some of your questions, or make another appointment to continue your conversation. When you get home, review your notes from your appointment. If you have any new questions, call the doctor’s office to ask. A nurse might be able to answer your questions, but if the nurse cannot help you, leave a message for the doctor. Monitor any symptoms you might be having, and let the doctor know if they get worse. Similarly, if the doctor prescribes new medication, let him or her know if you have side effects, or if the medication does not seem to be working. If you had a test, follow up if you don’t receive your results when the doctor said you would. Don’t assume that no news is good news; sometimes test results can fall through the cracks in a busy doctor’s office or lab. Learning to talk to your doctor will make your appointments less stressful and give you more control over your own health care.